With each file, you will receive data about any deceased individuals on your file. Using Excel sorting and filtering techniques, you can find any matched records by using the Match Value. Additionally, TrueDeceased only returns the records which have matched to the TrueDeceased deceased data source. This allows you to quickly review your file and suppress any deceased records. only to hear that the spouse passed away several years back. Individual matches will indicate if the person in your input record was matched to the deceased record. This means that both their first name and last name plus address, phone, or email was a match. Household matches will indicate if there was a match to a household member of a person in your input record. This means that the last name plus address of the input individual matched to the last name and address of the deceased individual. 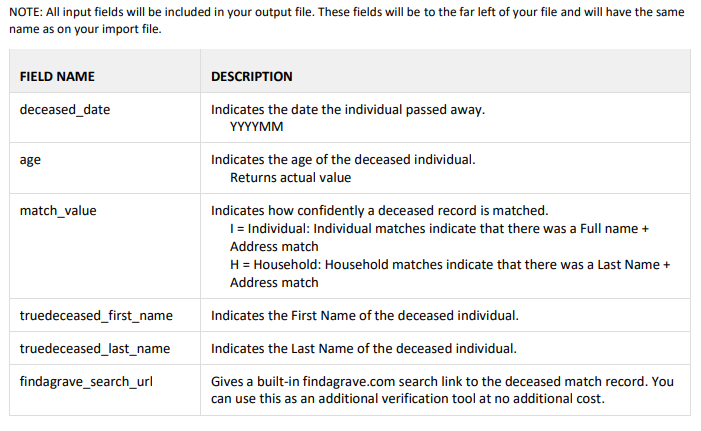 TrueDeceased provides built-in findagrave.com search links in our deceased output, to assist in the verification of matches on the Find a Grave site. Find a Grave allows you to search millions of grave records to further verify your deceased records. The Find a Grave search link does NOT change match rates, increase the number of matches, or decrease the number of matches. 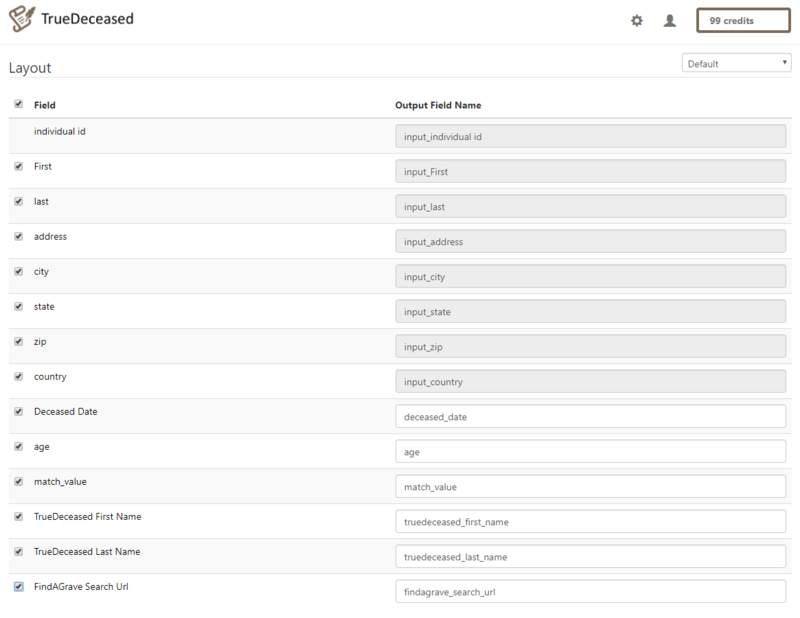 Instead, when TrueDeceased identifies a deceased match, we create a search link and include that on output. You can simply click the search link and it will run the search in your browser, using the name of the deceased that TrueDeceased matched to your input. You can use this as an additional verification tool at no additional cost.